A semi-custom quality boat cover by Oceansouth, suitable for cabin cruisers from 4.7m to 6.7m in length. These Oceansouth boat covers are tailored to fit over cabins and are supplied complete with tie-down straps. They are designed to fit boats with bow rails up to 400mm high and a windscreen or cabin up to 900mm high. The cabin cruiser cover is suitable for towing up to highway speeds. The boat cover was delivered very promptly. Its a very good fit. The on-line measuring guide was useful. This is an excellent product. With the assistance of Michael, we purchased this cover and the support pole and, following the discussion on which size cover to purchase, the fit was perfect. Very happy with this product - it is as strong and very well fitting as I was hoping for. I dont have much to compare with but the cover looked well designed and plenty of re-inforcing, but was not right size for my boat, I will order same again but larger. 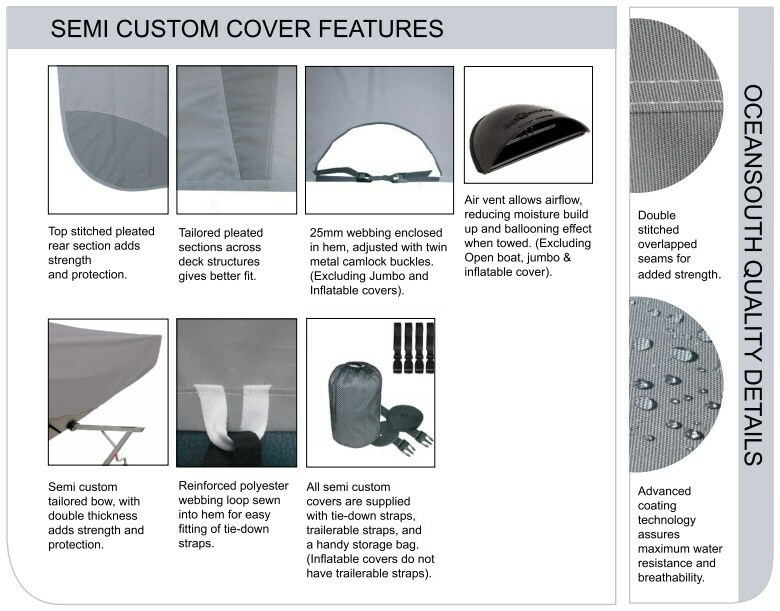 Click the button below to add the Boat Cover - Cabin Cruiser to your wish list.